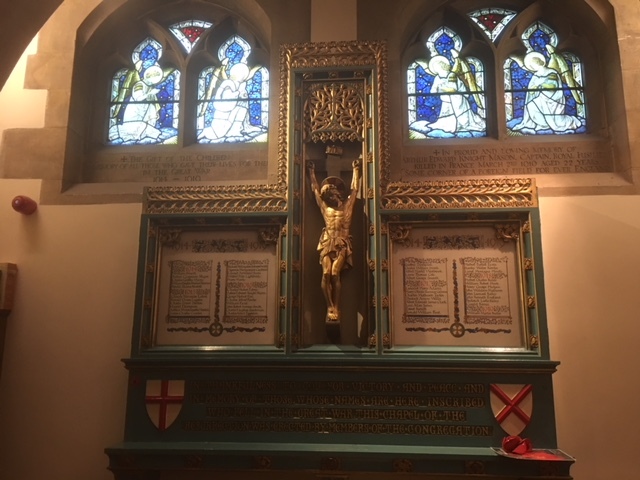 The war memorial in the middle of the North wall of the Lady Chapel records the 49 men who died on active service between 1914 and 1919 and gives thanks to God for victory and peace. The two windows above illustrate four angels – St. Alban and St. Martin, St.Michael and St. George.. The left hand window was ‘The gift of the children in memory of all those who gave their lives for them in the Great War 1914-1919.” The right-hand window is dedicated to Captain Arthur Mason, who died in March 1916. 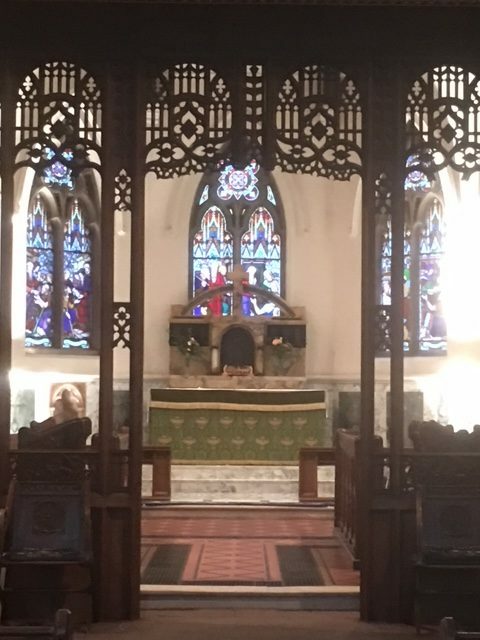 On the north wall of the Chapel there is a window commemorating the first seven Divisions (1st, 2nd, 3rd, 4th, 5th, 6th and Cavalry) that went to France between 4 August and 11 November 1914. It records the battles they fought and the men from Oatlands who died in them, namely: Captains Magor and Nesbitt, and Lieutenants Hume and Trimmer. The name L A James also appears. A special thank you to Mrs Jean Smith for access to her Monograph on Oatlands’ First World War Memorials. This has enabled me to identify all the names on the Memorial Tablet. This page gives a brief biography of each of them.